Background: Schizophrenia is a severe and debilitating mental disorder whose cause is still unclear. It is accompanied by cognitive deficits that are commonly attributed to a dysfunction of the frontal and temporal lobes. Recently, compelling experimental evidence has been collected suggesting a role also for the parietal lobe. Parietal lobe integrates sensory information among various modalities and is engaged in a number of cognitive operations. 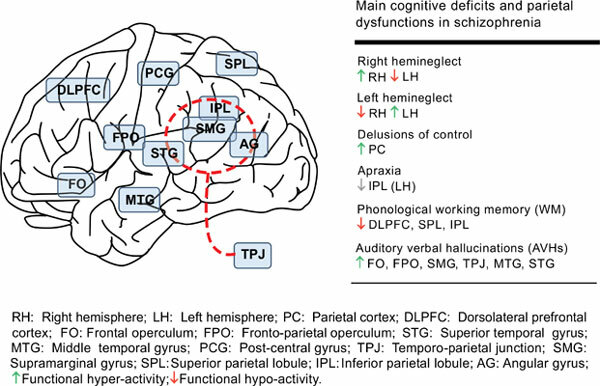 Objective: To review the existent literature on cognitive deficits present in schizophrenia that show suggestive analogies with deficits that follow lesions of the parietal lobe. Results: Analogies between cognitive disorders related to lesions of the parietal region and those related to schizophrenia were found for visuospatial attention, space representation, motor imagery, sense of agency, praxis abilities, and language. Conclusion: Some specific cognitive deficits present in schizophrenia can be attributed to parietal lobe impairment. This view is also supported by neuroimaging studies showing both structural and functional disorders of the parietal lobe in schizophrenia. Furthermore, being parietal areas functionally interconnected with other brain regions, parietal impairment may also contribute to deficits usually attributed to the dysfunction of other brain regions. Keywords: Schizophrenia, parietal cortex, attention, neglect, motor imagery, delusions of control, apraxia, language disorders. Keywords:Schizophrenia, parietal cortex, attention, neglect, motor imagery, delusions of control, apraxia, language disorders. Abstract:Background: Schizophrenia is a severe and debilitating mental disorder whose cause is still unclear. It is accompanied by cognitive deficits that are commonly attributed to a dysfunction of the frontal and temporal lobes. Recently, compelling experimental evidence has been collected suggesting a role also for the parietal lobe. Parietal lobe integrates sensory information among various modalities and is engaged in a number of cognitive operations.